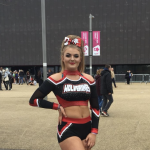 Lauren Desouza joined the Basingstoke Wolverines in 2009 at the age of six and was a member of the Basingstoke Wolverines squad who became Future Cheer National Champion in 2017. Cheerleading is a passion for Lauren, who eats, breathes and sleeps cheer. Her application to become a junior coach was outstanding and she was selected to become Junior Coach in 2014 and became a qualified coach at USASF levels 1 and 2 in stunts, tosses and tumble in 2017. Lauren will assist the head coach with Mystique, Junior Level 1 Prep for the 2018-2019 season.